Oh my goodness babka! It has been on my to-do list for a while. Chocolate and pear is a combination that's hard to argue with, and babka is delicious no matter what the filling. I made this last weekend before venturing off to Miami, pre-blizzard for Free People. It was nice to get a little break from this winter weather, however late it was this year. After a few days in the sun, craving all the things that come along with warm weather (having an acai bowl at some point during the trip was a main priority) I'm back to my winter reality where I'm craving things like this. So about this babka. I knew getting into this that the caramelized pear filling could be tricky to work with, but ultimately everything cooperated pretty smoothly. A few notes on this beauty. The pears, even though cooked down can make the rolling part a little more difficult given the weight. Not to worry, it will roll up just fine, just take your time doing it. I found the dough is much easier to handle after chilling, this time around I let it chill for 2 hours, and it was relatively easy enough to work with but next time I think I'll be letting it chill overnight. If you're snowed in like we are, I hope you're having the coziest weekend ever. Using a stand mixer with the dough attachment, add warm water and yeast and let stand for 5 minutes until the mixture begins to foam. In a mixing bowl, combine the flour, sugar and kosher salt. Once the yeast mixture is foaming, add eggs and begin to mix on low speed. Add the dry ingredients, about 1/4 at a time, scraping the bowl as you good. About halfway through adding the dry mixture, increase speed to the medium setting and continue mixing until the dough is formed. Add the butter and continue mixing until fully incorporated, this should take about 3-5 minutes. Once the dough is fully formed and the butter is incorporated, cover with plastic wrap and set aside in a warm place to rise for 1 hour. Prepare a baking sheet with parchment and cooking spray. Divide the dough in half equally, place on the pan and cover with plastic wrap. Refrigerate for 2-3 hours until firm. *Note the dough can be refrigerated overnight as well. While the dough is chilling, prepare the caramelized pears and chocolate filling. Grease two 9" x 5" loaf pans with butter and set aside. Working one piece at a time, roll the dough into a 10x12 inch rectangle. Spread half the chocolate filling evenly across the dough, reserving a 1/2 inch border around the edge. Spoon the pear filling on top of the chocolate, spreading evenly as you go. Starting at the edge closest to you, roll the dough into a tight log. Using a sharp knife, slice the dough down the middle, almost all the way to the top, leaving about 1/2" of the top connected. Begin to braid the dough by twisting the strands together. Pinch at the end to seal and carefully place the dough in the prepared bread pan. Repeat with the remaining dough and filling. Cover each loaf with plastic wrap and let rise 1 hour. Bake at 350° for 45 minutes, until golden brown and cooked through. Allow the loaves to cool in the pan for 20 minutes before removing. Slice and serve once completely cooled. In a skillet over medium high heat, melt butter until foaming. Add pears, cinnamon and brown sugar. 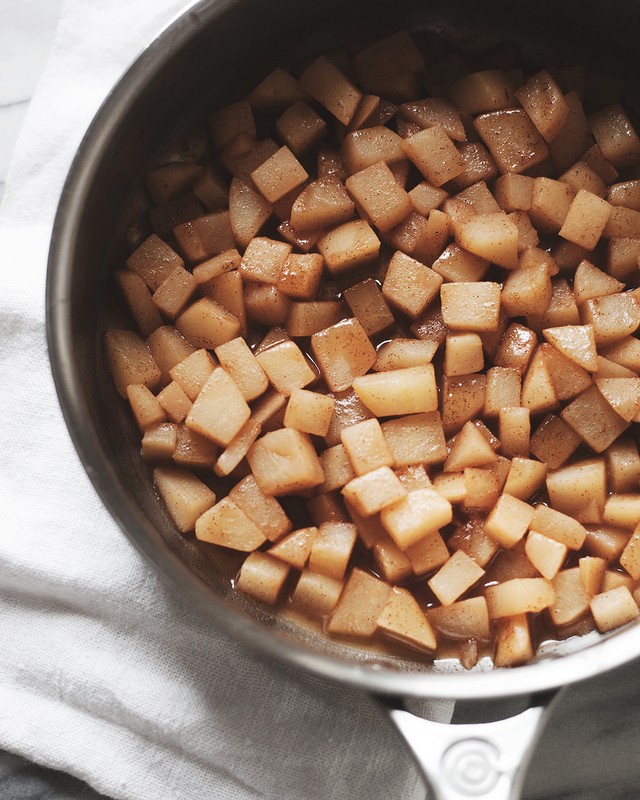 Cook until pears have softened and browned, about 10-15 minutes. Remove from heat and transfer to a bowl to cool to room temp. In a sauce pan over low heat, melt the dark chocolate with the butter. Whisk to combine until smooth, set aside to cool.